Koalas are not bears! They are marsupials, which mean that their young are born immature and continue to develop in the safety of a pouch. Koalas are most active at night; however the majority of their activities, including feeding occur just after sunset. They will communicate with one another through loud grunts and squealing noises. During the day, koalas can sleep for up to 20 hours in the fork of a tree to conserve energy. Koalas have several ‘home trees’ that they choose to visit and sleep in regularly. 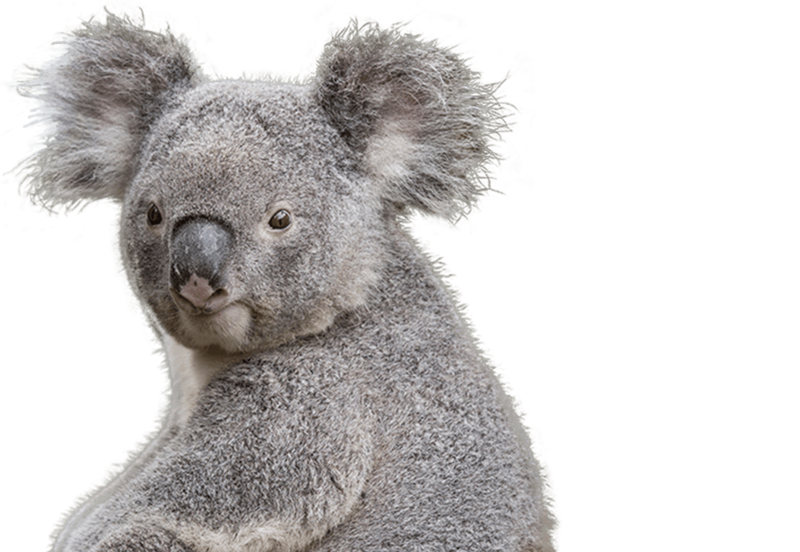 Aside from the ring-tail possum and the greater glider, koalas are the only other mammal that can survive solely on a diet of Eucalyptus leaves. Eucalyptus leaves are highly fibrous, contain very little protein (about 2%) and to most animals are extremely poisonous. With a specialised digestive system and a slow metabolism, Koalas are able to detoxify the leaves and maximise the energy absorbed from such a poor nutritional diet. Koalas only eat the freshest, juiciest tips of Eucalyptus leaves, and consume about 500g–1kg per day. Of the approximate 600 species of Eucalyptus tree in Australia, Koalas only eat around 40–50 of these species. Their noses are very sensitive and are able to detect the type of Eucalypt they prefer just by sniffing at the base of the tree. The National Zoo & Aquarium is home to 1 koala; Matilda.